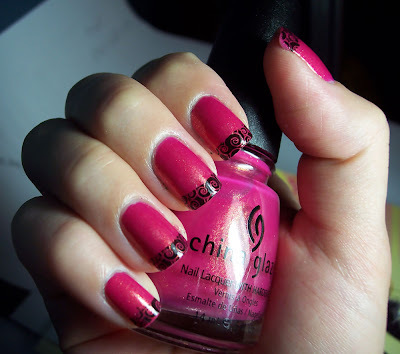 Today is China Glaze Strawberry Fields with m56 pattern using Color Club Where's the Soiree?. I did okay but some of my nails were crooked, the french tip pattern was really hard for me. I use less than half the pattern so the curve they put in it for you throws me off. Where's the Soiree was a bad konad polish choice it dried almost instantly! I will try my Wet n Wild black next time. Left hand, I'm going to try to show both hands to see if I improve on both sides. This is beautiful, I love the gold shimmer in it, it looks like such a candy colo. Plus the swirled tips are a lovely design. Kae you nails look so pretty. I love the french tip design. I really can't tell if there crooked. I like Strawberry Fiels, looks very pretty on you. Clockwork: thanks, and yeah doesn't it look like it should be in a bag of Skittles or something? I love that pink with the black swirl! Awesome. Oh, that is adorable - I actually love the design and I can't see anything either. I didn't pick up Strawberry Fields yet - but I can see right now from this swatch I will be going back for it, that's an adorable pink. Alexlyndra: thanks, the last picture really shows the gold glitter in the bottle. Olivia: haha thanks, you come on saturday plain nails k? Nicole: Thank you, I guess you just see every imperfection on stuff you did yourself. We can put Lubu Heels on it to make it all better!